Aram Sei is very excited and honored to be partnering with the one and ONLY, Sanhiti again for their 11th annual production! “Theru” Koothu. As always, this year’s show promises to be mind-blowing with the concept revolving around reminiscing memories of the street one lived in, back home in India. Come join us on April 8/9 to sit back, relax and enjoy the beautiful ride as the talented artistes take you on a nostalgic journey through their dance, while supporting our noble cause. 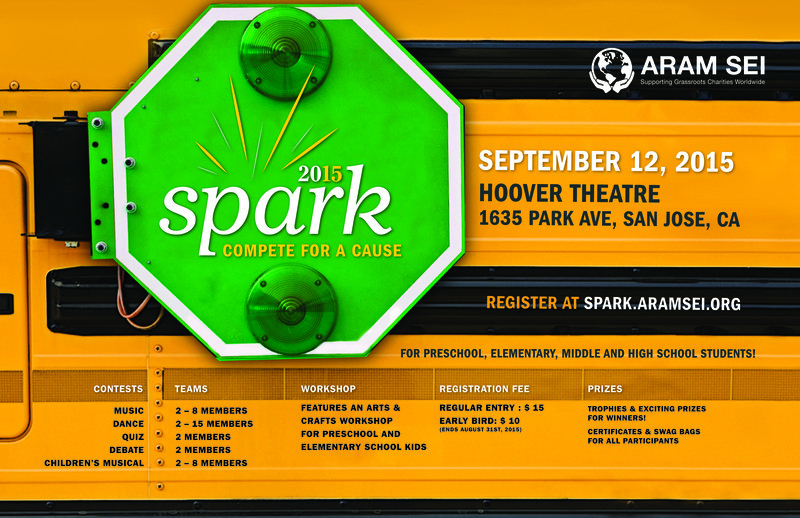 Aram Sei’s ‘Spark – Compete For A Cause’, scheduled for September 24, 2016, Saturday at Hoover theater, Park Avenue, San Jose, CA. ‘Spark – Compete For A Cause’ includes team based competitions in Quiz, Debate, Dance, Music and Drama for children from Preschool, Elementary, Middle and High School. Spark provides a great opportunity for parents to work with a non-profit partner like us to enhance your child(ren) overall achievement. Additionally, Spark provides children a platform to showcase their talents while getting involved in serving the community. There are many exciting prizes to be won including awards for the winners and participation certificates for all! Registration for Spark is now open at spark.aramsei.org. Smaran Performing Arts and Aram Sei presents SMARAN DANCE FESTIVAL – 2015 with exciting programs. Heartiest congratulations to all the winners! The biggest highlight of this year’s festival is a performance by one of the great Bharatanatyam exponent, Indira Kadambi, from Chennai India. Not forgetting to mention that all the earnings at this festival goes to this year’s projects at Aram Sei. For more details about the project, please visit the Projects page. Early Bird Discounts Available only till November 1st. Tickets available for only 20$. Aram Sei’s second annual signature event, ‘Spark – Compete For A Cause’, is scheduled for September 12, 2015! ‘Spark – Compete For A Cause’ has something for everyone. 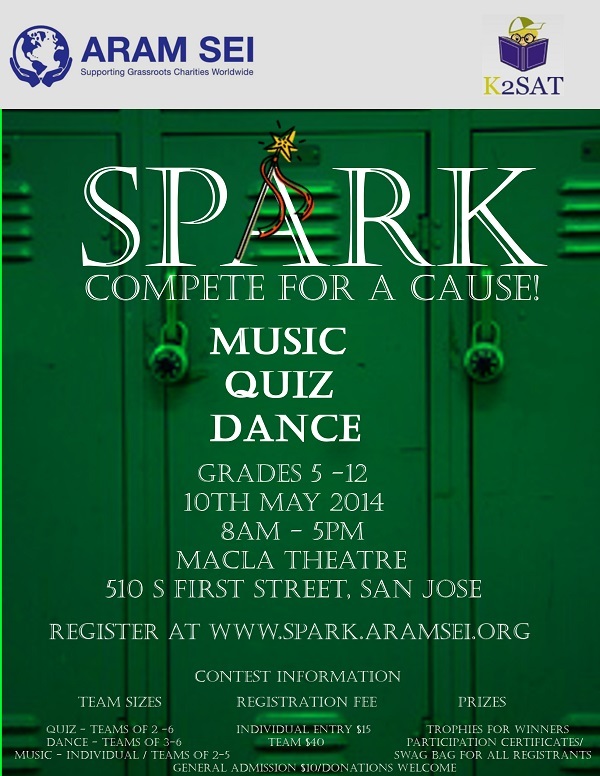 Spark includes team based competitions in Quiz, Debate, Dance, Music and Drama and an Arts & Crafts workshop for children from Elementary, Middle and High School and Preschool. 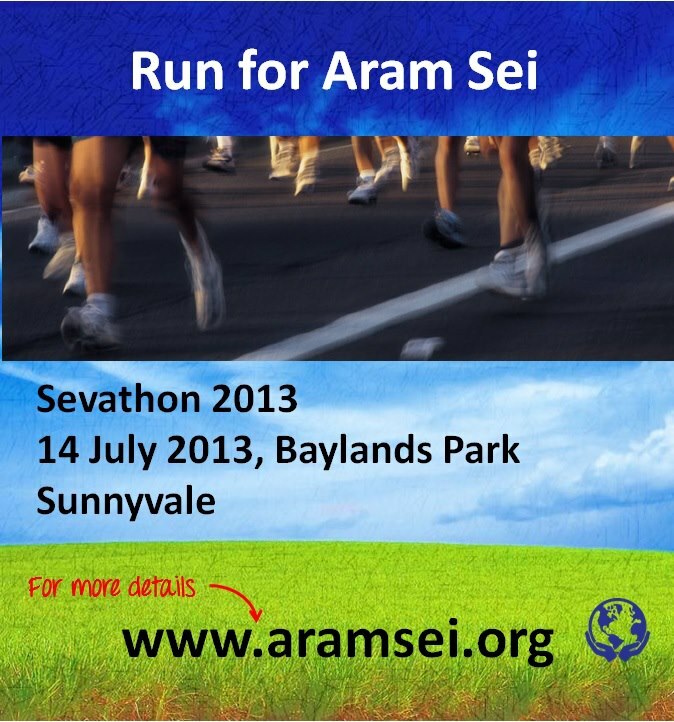 We are very pleased to announce that Aram Sei is partnering with Sevathon for the third consecutive year. We cordially invite you all to join us in being a part of this healthy and noble initiative and make an impact. It gives us a great pleasure to announce our first fund raiser event on March 1, 2015, Aram Sei & K2SAT present Open Quiz 2015. We have once again been fortunate to secure and retain the partnership with K2SAT, our sponsor of three years, who immediately confirmed their support to Aram Sei in 2015! Registration now open Aram Sei Open Quiz 2015. Aram Sei is glad to be associated with Sanhiti in their 10th annual production Maayajaa. This is the third consecutive year since inception that we are identified as their beneficiary. An awesome show and congrats to the entire Sanhiti’s team for putting up a flawless performance. 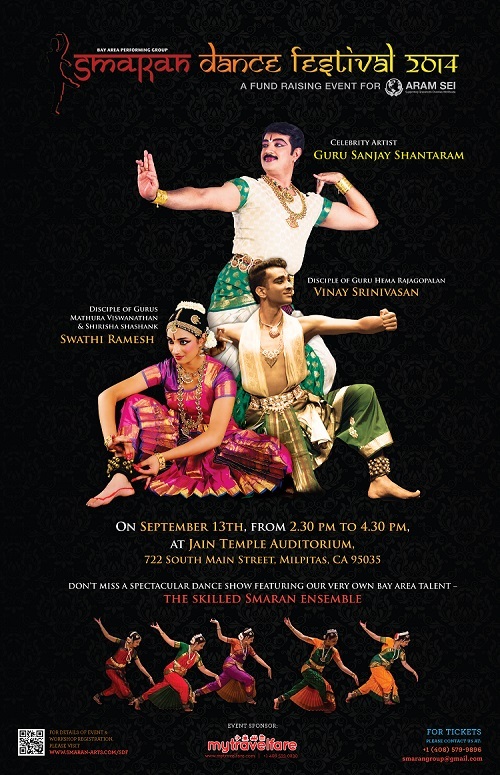 Aram Sei partnered with Smaran to present Bay Area’s first ‘Smaran Dance Festival 2014’ at Jain Temple, Milpitas. This was a platform for young dancers to showcase their talents and participate in a workshop conducted by renowned artists. 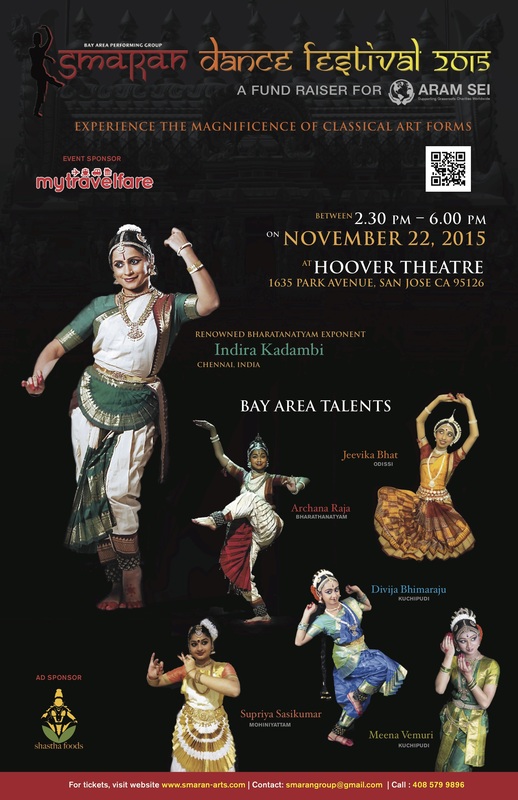 Bay Area’s own amazingly talented dancers Vinay and Swathi performed solos at Smaran Dance Festival – 2014 along with celebrity artist from India Guru Dr.Sanjay Shantaram and Smaran Ensemble. Aram Sei was identified as a beneficiary for this high energy Concert that was held on July 13th, Sunday 3:30 to 9:00PM at San Jose Event Center, San Jose, CA. Many thanks to the generosity of the show producers. 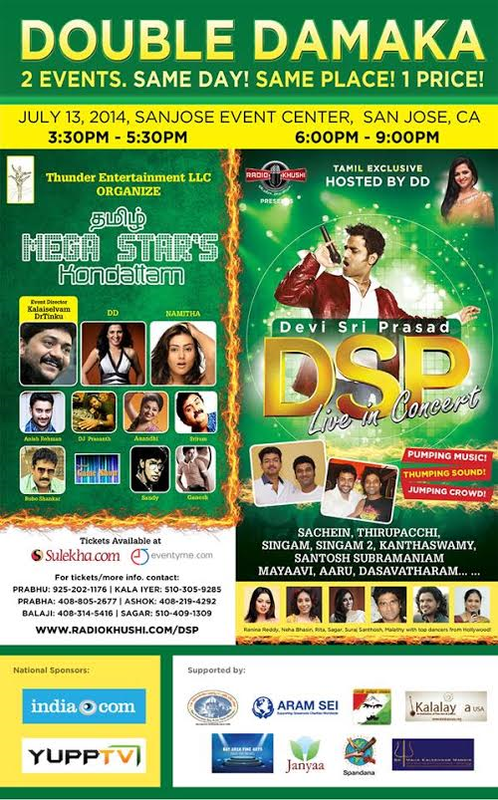 We thank Devi Sri Prasad and the event organizers for identifying us as one of the the beneficiary. Aram Sei had over 65 participants who took part in various events – walkathon/runathon or Yogathon at Sevathon ’14. Check out our Aram Sei Facebook for pictures and related news. Stay Tuned for Sevathon 2015!! 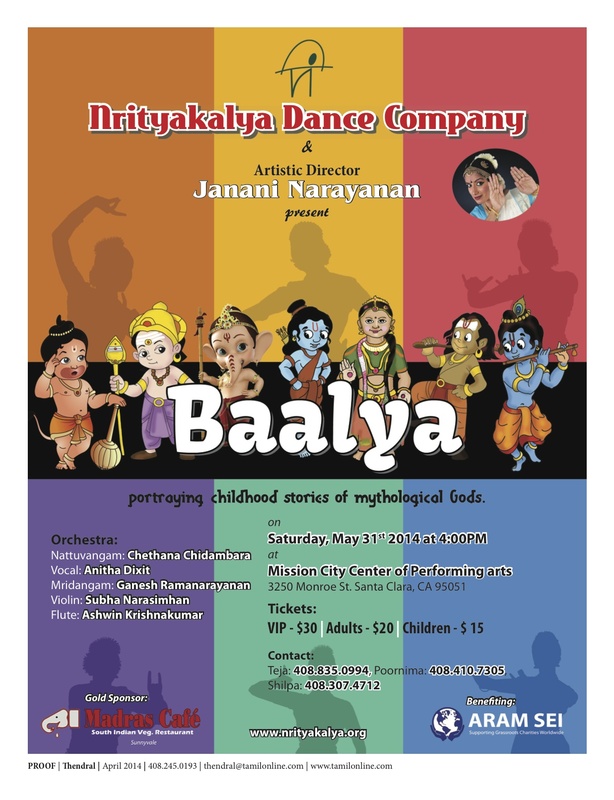 Nrityakalya Dance Company’s first home production – ‘Baalya’ was a great success. This dance drama presented by Nrityakalya’s first batch of students depicts childhood stories of mythological characters. We are honored to be their first beneficiary and congratulate them for conducting a successful event. Aram Sei thanks Baalya for choosing us. Looking forward for many more productions from Nrityakalya Dance Company. Aram Sei successfully organized its inaugural signature event: ‘SPARK – Compete for a cause’ on May 10, 2014. It was a Music, Quiz & Dance event conducted between grades Five and Twelve. For any further information, please contact us or visit http://spark.aramsei.org/. 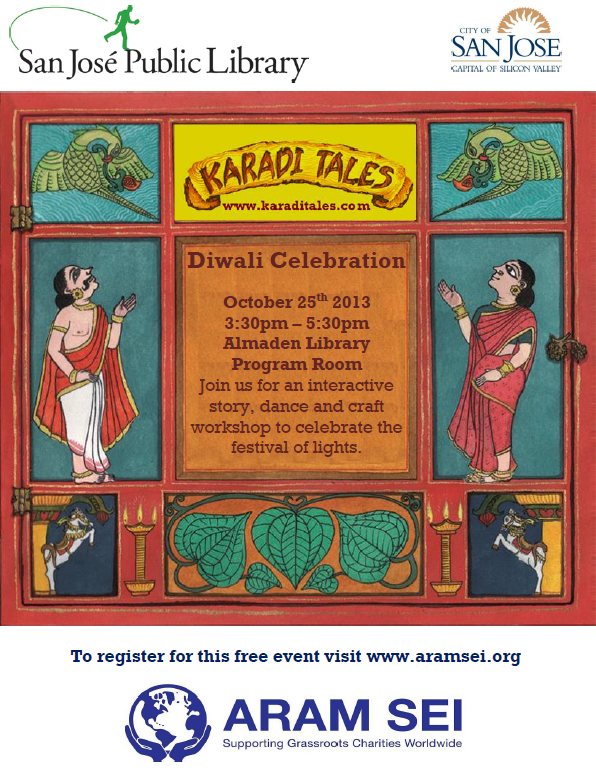 Aram Sei was supported by Ilayaragam, a south-indian music troup based in the bay area through their annual production. 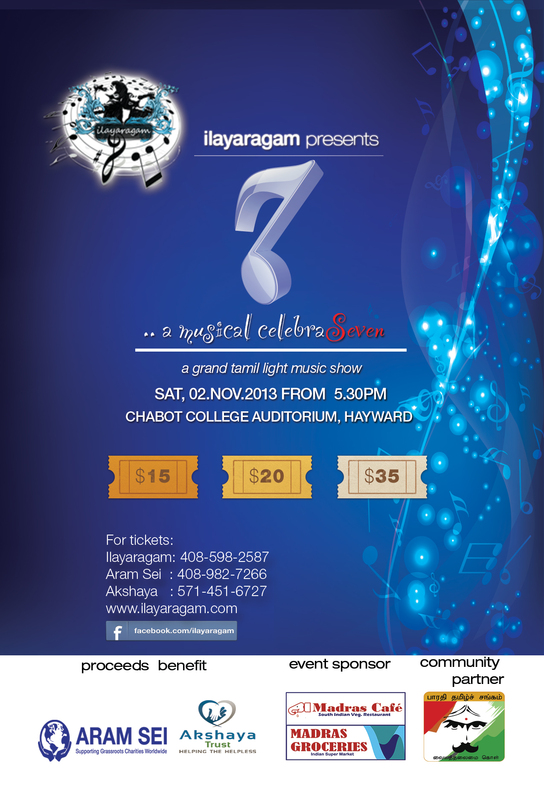 ‘7 – a musical celebraseven’, Ilayaragam’s 7th production was attended by over 900 bay area music enthusiasts on 2nd Nov 2013. Thanks Ilayaragam for choosing Aram Sei as the beneficiary. Janz conducted a fundraiser for Aram Sei at The Dance Studio – Cupertino. It was a fun event which involved doing good to both your body and to the community. A successful event which was well received by the community. 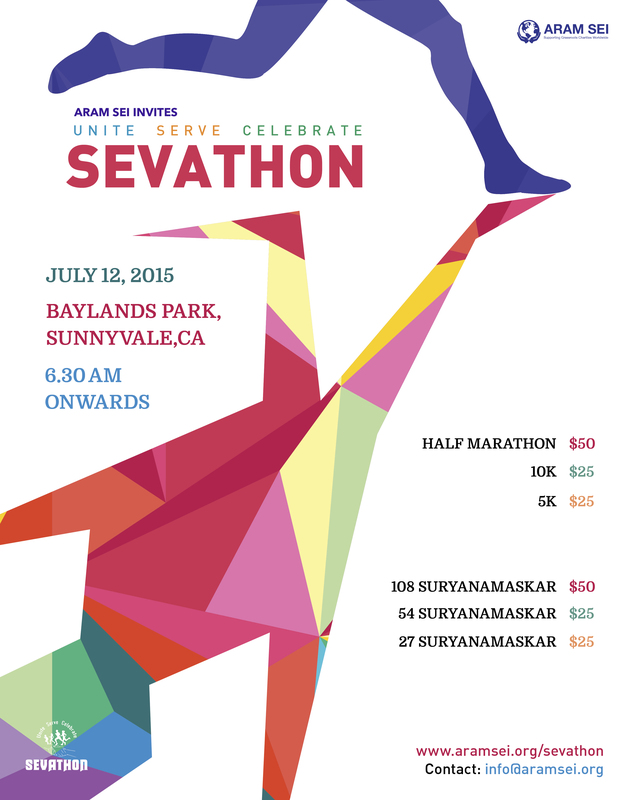 Over 25 people ran on behalf of Aram Sei at Sevathon 2013, organized by the India Community Center, on July 14th at the Sunnyvale Baylands Park. This event is aligned with Aram Sei’s focus on healthcare in addition to education. Aram Sei supporters had a great time running for a great cause! 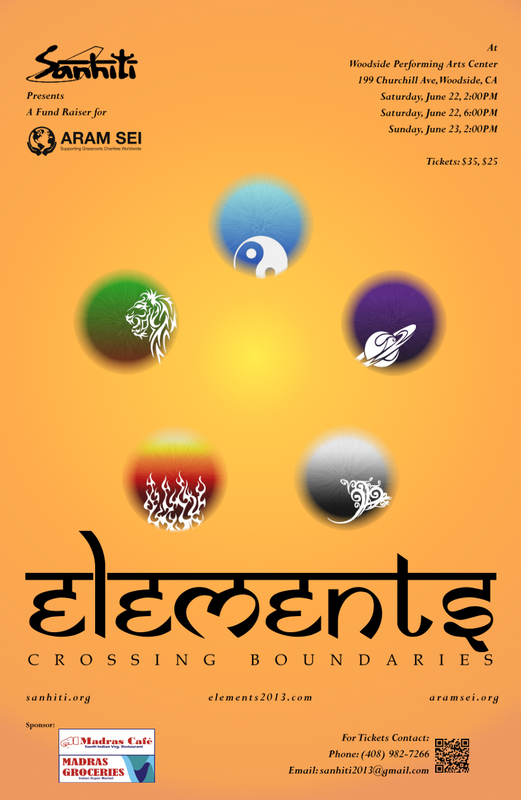 Aram Sei partnered with Sanhiti, Bay Area’s leading dance group, to produce and organize Elements – Crossing Boundaries. This show was attended by over 1200 people and was conducted in support of The Grateful Garment Project and Community Health and Education Society. Hope you will enjoy this video. Over 1000 Bay Area residents joined us for Masala, Aram Sei’s first major fundraising event this year in partnership with Visweta. Aram Sei’s booth was abuzz with donors and well-wishers queuing up to pledge support. Many of the donors expressed interest in joining us as volunteers as well. 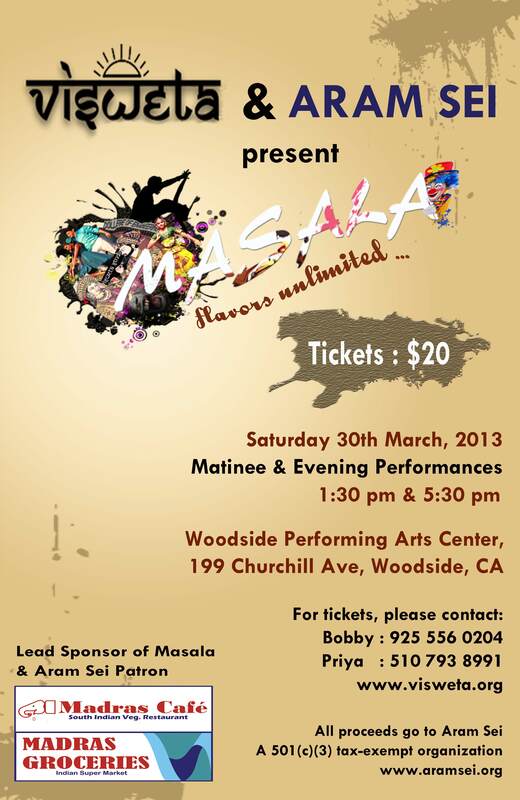 Check out the photographs from Masala! On 27th Oct 2012, Aram Sei and Infinitheism came together to deliver Mahatria’s discourse on Relationships. This was the very first event for Infinitheism in the Bay Area and the take-away from the discourse resonated very well with the values espoused by Aram Sei. Over 1200 Bay Area residents ushered in the spring season by attending Perceptions, Aram Sei’s first major fund raising event this year. Perceptions was Sanhiti‘s 8th annual production and was a mesmerizing show that brought together dance, lighting, and special effects to deliver an immersive experience for the audience. All proceeds from Perceptions will go towards education and health of underprivileged children in India. Perceptions turned out to be a watershed event for Aram Sei. The audience responded with enthusiasm by donating generously to Aram Sei’s cause. We are happy to announce that we have already raised enough funds to support over 250 children! On behalf of all the volunteers of Aram Sei, a big Thank You to all our supporters!